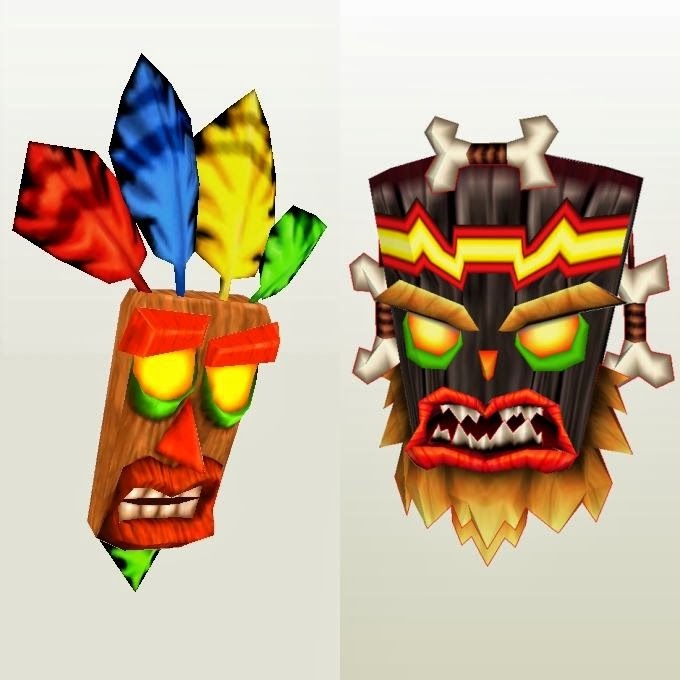 In the universe of the Crash Bandicoot series of video games, Aku Aku and Uka Uka are living masks. Aku Aku is (in most games) the narrator and guide for Crash and his companions. Uka Uka is Aku Aku's evil "twin" who is the prime antagonist in the series. These papercraft masks are how the characters appear in the Crash Nitro Kart video game. The templates for the masks may be downloaded here and here. The creators of the templates are DeviantARTists Letourbillonenchant and Stange1337. 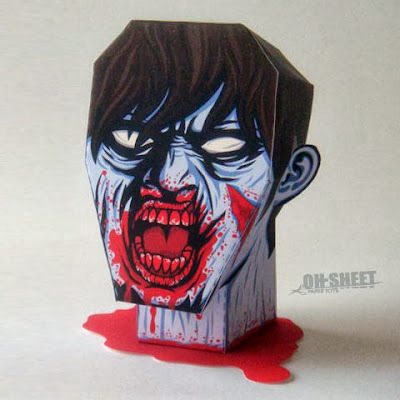 If you are looking for gore in your Halloween paper toys, this severed zombie head paper toy is just the ticket. The toy includes a pool of blood along with the head. Presumably the blood is from the zombie's last meal as zombies don't have blood flowing through their veins any longer... do they? ;) The template for the toy is the creation of Abi Braceros and may be downloaded here. Due to my busy schedule this year, I have not been able to release very many of my papercraft works in progress. In the interest of getting some things completed, I decided to focus on a couple of my smaller projects. Here is the first one to be finished. This paper model is of a comlink as it appears in the video game Star Wars Jedi Knight: Jedi Academy. In the Star Wars universe, comlinks are small communication devices that are used like walkie-talkies. In Star Wars: A New Hope, Luke Skywalker and C-3PO use similar comlinks to communicate when they are on the Death Star. 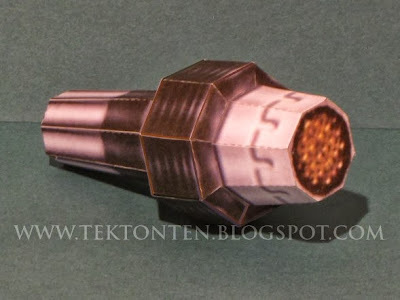 This papercraft is 1:1 scale. A4 and Letter size templates may be downloaded here. In 1975 the UK breakfast cereal brand Weetabix offered Doctor Who cut outs on the back of their cereal boxes. One of the cut outs was a TARDIS paper model. 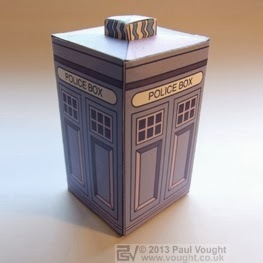 Original copies of the Weetabix TARDIS are hard to come by these days, but thanks to Paul Vought we can build a replica of the vintage papercraft. A download of Paul's TARDIS template based on the original is available here. 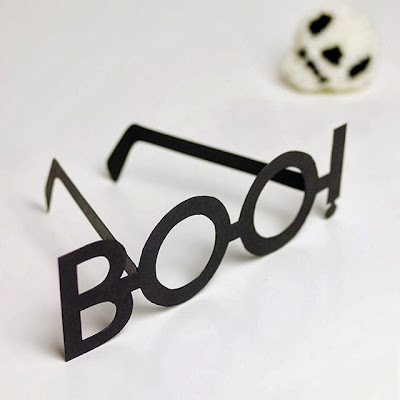 A simple something to wear when handing out candy on Halloween... "Boo!" glasses. These papercraft spectacles even fold like real ones when not in use. The PDF template for the specs may be downloaded at mrprintables.com. The 1968 animated movie, Yellow Submarine, features the music of the Beatles. The animation in the film is done in the "psychedelic style" of art popularized in the 60's by artists like Peter Max. 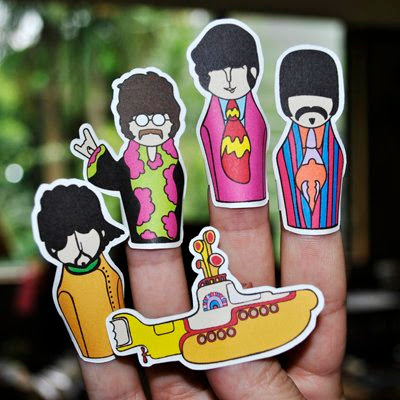 These Yellow Submarine finger puppets faithfully recreate the movie's style. The templates for the puppets were created by Hanasaurusrex and may be downloaded here. The Saint Seiya animated television series originally aired in the 80's. The story line of the show follows the exploits of five mystical warriors called "saints". Each of the warriors was identified with a different constellation of the zodiac. Pictured are four paper models of the saints. 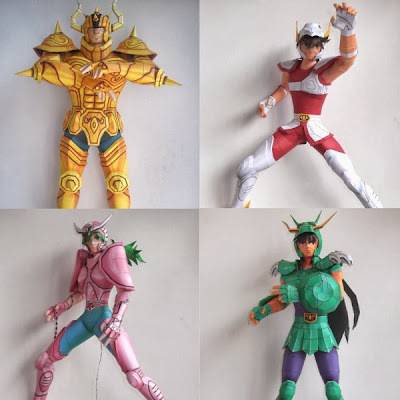 From the upper left going clockwise are Aldebaran, Shun, Seiya, and Shiryu. 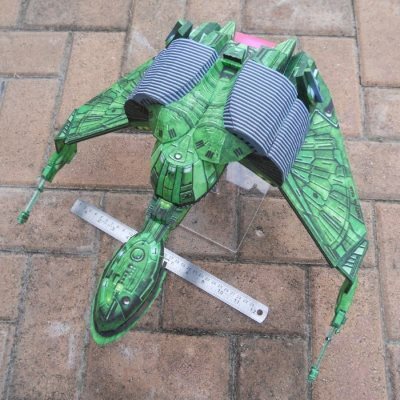 The models were created by Ace Crafts. The templates may be downloaded here. It's October again. 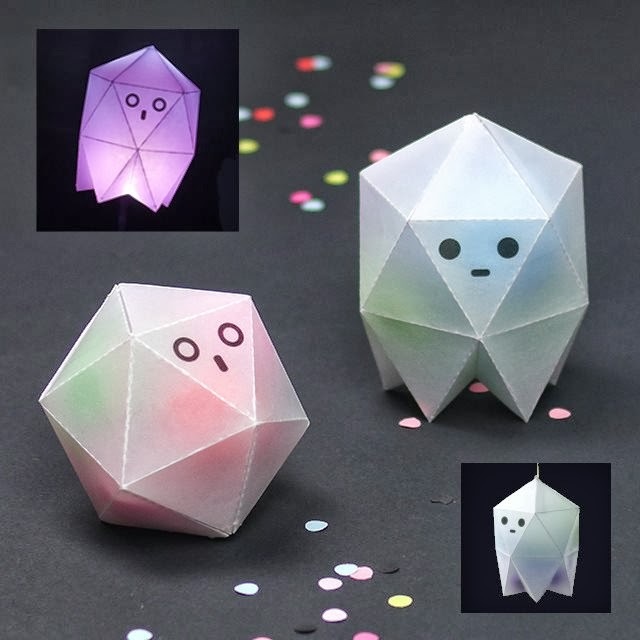 You know what that means... Halloween papercraft! 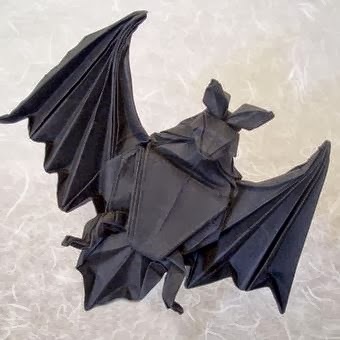 Here's an excellent origami bat folded from a single square of paper. The pattern for the piece was created by published origami artist, Noboru Miyajima. An illustrated folding diagram for the bat may be downloaded here.